The new $1 Loaded Nacho Taco is set to arrive at Taco Bell on April 4, 2019 as their latest limited-time value menu item. 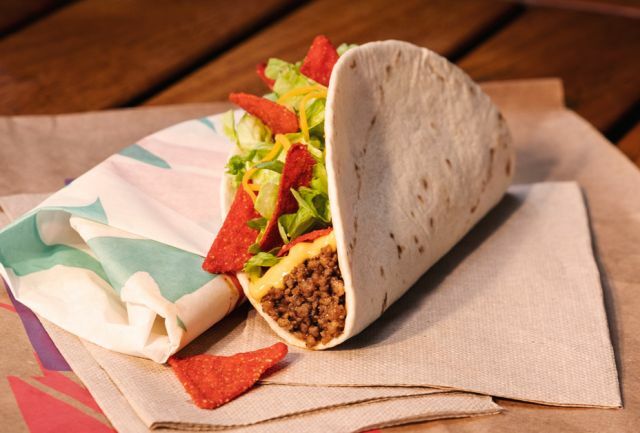 The Loaded Nacho Taco features a soft flour tortilla filled with seasoned beef, nacho cheese sauce, lettuce, shredded cheddar cheese, and new Southwest Seasoned Chips. The new, crunchy red tortilla chips come dusted with Southwest seasoning, which consists of lime, tomato, and garlic. The new taco will also come in a spicy version which adds jalapenos to the mix. Both regular and spicy versions will cost you $1 each. You can also get the Loaded Nacho Taco as part of a $5 Box, which also includes a Beefy 5-Layer Burrito, crunchy taco, Cinnamon Twists, and a medium fountain drink.